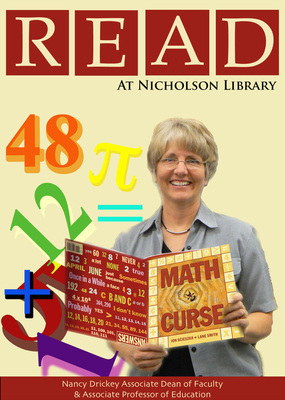 Nancy Drickey, Associate Dean of Faculty and Associate Professor of Education, reading Math Curse, by Jon Scieszka and Lane Smith. Terry, Paula and Nicholson Library Staff, "Nancy Drickey READ Poster" (2009). READ Poster Gallery. Image. Submission 53.